Friday evening saw three bands return after varying lengths of time to the Whitchurch Festival stage. Saturday continued this trend to some degree though half the acts made their debut today. As in past years there were afternoon and evening sessions. With the evening shows being held in what was the afternoon venue in previous years a smaller room above the main hall was brought into use for the daylight section of the festival. Living within a 45 minute drive of Whitchrch I'd headed home after the Friday shows and expected to be back in plenty of time for the Saturday afternoon performances. As usual though plans didn't quite work out as planned and with all manner of little problems (getting the new HP Jornada linked to the PC mainly) I was late in bed and even later up the following morning. The music was advertised as running from 12 so I was a little surprised to hear the first band being introduced as I pulled up at 12:45. By the time I found my way upstairs ONE IOTA were well into their first number and most of the seats with views were already taken. I had to sit on a raised area which had almost no view of the performance area due to an internal wall blocking half the room. 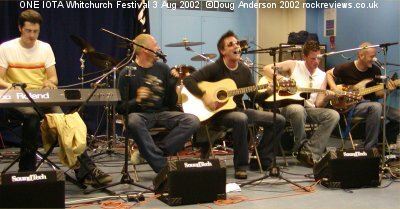 Basingstoke based the band were fairly local and proved to be a nice mixture of fairly poppy originals and covers, each of which seemed to be labelled "one of the greatest pop songs ever written." When they played 'Sunshine' they reckoned "the sun should be shining." It was, and between showers too, so maybe they had some mystical meteorological powers hidden within the music. 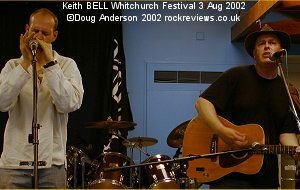 With the next act was even later than I in arriving from Reading Keith Bell took the stage for a short set that included Tim Buckley's 'Song to the Siren'. Both repertoire and musicians were expanded to include Mr Jonathan Leyland and his blues harp on the "progressive rhythm and blues" of 'Northern Sky'. John Mitchell arrived about this point and readied his guitar while 'Van Morrison's 'Brown Eyed Girl and 'Viva Las Vegas' rounded off a popular impromptu set. 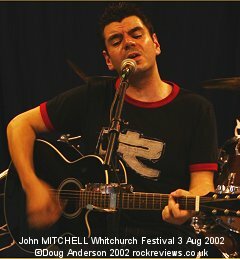 A little later than anticipated came the slightly stressed John Mitchell but that didn't stop him providing a fine half hour set that mixed a variety of material that people may not have expected of the Arena guitarist. After opener 'Weeds' he explained who he was and his pedigree before a far different version of The Urbane's, John's other band, 'Fading Out'. This track stands out in this acoustic form and allows the vocals to come over in a far more relaxed way than the rocking band version. From there the material alternated between covers (Peter Gabriel's maudlin 'In Your Eyes' and Ray Wilson's 'Another Day') and more Urbane tracks all of which went down well with the receptive audience. Probably the most surprising track of the set was closer 'Time After Time' where John admitted things got much happier. If the title is familiar you would be right in thinking it is a Cindy Lauper track and one that John holds dear as she was his first crush. I'm sure a few people were covered when he slipped in "bet you never thought you'd hear this at a prog rock festival" half way through. Everybody seemed to enjoy the half-hour set and that cover may well have been the surprising highlight of the set. With his satisfying work done John packed up and left to enjoy himself for the rest of the day, his hero Francis Dunnery in particular. I missed Haze last year and the one before I'd been rather disappointed considering how much I enjoyed them in 1999. This afternoon they had the benefit of a much longer show, longer still thanks to John Mitchell playing such a compact set, and took full advantage by playing for just shy of two hours. 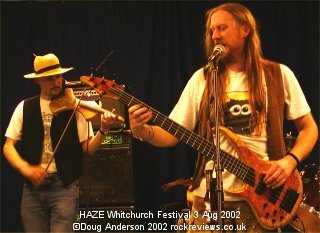 If you are not familiar with Haze I should explain that the three man line-up of brothers Chris and Paul McMahon (bass/keyboards and guitar) and percussionist Paul Chisnell also form the core of a couple of other Sheffield based bands, Treebeard appearing the following afternoon. However, as they were ahead of time they squeezed a Treebeard song in first, which allowed Paul C to roam the stage with his hand 'Wave'ing from the strangest places. Fiddler Gordon Walker joined them for this before departing the stage for the trio to slowly veer from folk to rock during 'Nice 'n Steady'. 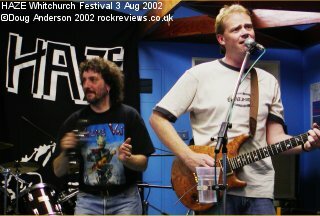 Sound problems resulted in some lead swapping (and beer spilling) before they moved on with more progressive and rock material that included their third band, World Turtle's 'Wolf'. With smiles on their faces they entertained the hooked crowd and Chris was especially happy during 'Another Country' where he was allowed to "freak out" twice, once on tambourine and again on an extended keyboard assault for which he received the loudest applause so far this afternoon. A brief respite care of the more restrained 'My Inspiration' was soon over as more prog mayhem, in the form of 'The Hum', consumed the audience. Just to prove that they kept their writing hand in a new song followed. As the music continued to vary as frequently as Chris swapped instruments they even managed to slip in a few bars of a funked up 'Smoke on the Water'. They moved into the last song of the set but promised it would be a long one. True to form about a third of the way through the McMahon brothers walked forward from the stage area and out through the crowd towards the bar area. I'm sure Paul C would have joined them if his drumkit was fitted with wheels. They returned, still playing, several minutes later to conclude the track and set. The audience were hungry for more and so Gordon was brought back to expand the line-up for a track that included sections of Led Zeppelin and Pink Floyd before returning to self penned material and 'Heavy Wood'. The show concluded with two more covers, one by the Strawbs while the finale was the classic Floyd track 'Comfortably Numb' which had the added bonus of guitar and electric violin alternating the main riff. The violin also provided what would have been screaming voices on the original. Haze proved popular once again and with a special 3 for twenty quid festival deal followed the music up with equally healthy sales. With an afternoon this good I wondered if the evening could compete? This page is Copyright © Doug Anderson 2000 - 2002. Created: 02 Aug 2002. Last updated: 28 August, 2002.